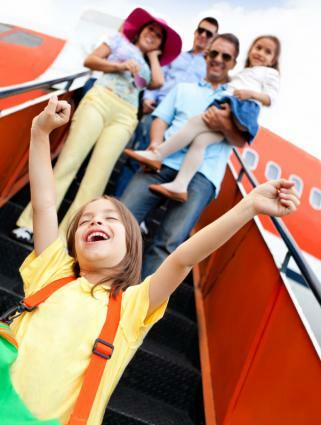 Holiday travel can be both stressful and enjoyable. Although you may have to deal with throngs of people, you also have the luxury of getting away during one of the busiest times of year. Whether you're headed out to see family or getting away from the hustle and bustle for vacation, keep in mind that you'll likely be traveling with hundreds or thousands of other people going the same way. There really isn't such a thing as a 'cheap' flight these days, especially during the holidays, but, there are a few tricks you can use to save yourself some cash. Airlines are well aware that most people really do not have a choice but to travel a bit before a holiday and a bit afterwards. However, if you have some flexibility and want to save yourself some money, fly on the actual holiday rather than flying immediately before or just after. For example, if you must go visit Aunt Bessie for Thanksgiving, leave Thanksgiving morning, and then fly back on Tuesday or Wednesday of the following week. While prices fluctuate, and there's no way to know exactly how much you'll save with this strategy, the experts at FareCompare point out that actual holidays tend to be honorary 'dead' dates. That's why flights are cheaper on these days than on the surrounding days when the majority of people have to travel. While you can certainly purchase your tickets through CheapAir.com, it's the handy holiday flight guide that is most helpful to holiday travelers. Updated to the current holiday, the guide gives specific dates and notes on the types of prices you can expect to pay. If you have some flexibility with your dates, it is well-worth checking out as the calendar feature will tell you what days are best to travel on surrounding your holiday. What if you have no flexibility surrounding your holiday travel dates? In this case, the best thing to do is plan and book early. This way you don't run the risk of your hotel or flight getting filled up during a busy time. In addition, the typical trend in plane tickets is for the price to go up, not down, so you're likely to save money by booking early as well. According to USA Today, traveling on, or right before, holidays might snarl some of your best laid plans. However, there are a few things you can do to minimize your hassle as you make your way through the airport. If you are flying for the Christmas season, don't wrap gifts you are traveling with. When the TSA inspects a suitcase, they may need to unwrap your gift in order to check it before the bag can make it onward. Avoid this frustration and either mail the gifts beforehand or leave them unwrapped, bringing your folded wrapping paper with you. 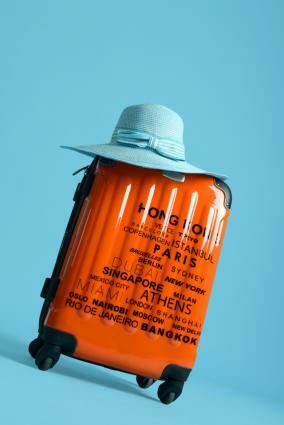 Choose luggage that stands out! Given the increase in volume of travelers, get to the airport extra-early to give yourself time to get through security. Before you leave home, you can check the current wait time at security by viewing MyTSA. With extra travelers comes extra luggage and the increased likelihood that you might lose a piece. The Travel Channel actually advises that you avoid checking your luggage altogether if possible. The move helps save time, and will ensure that everything you want to have, you have. If you do check luggage, make sure all of your must-have items (documents, medications, toiletries) are in a carry-on. In addition, if you have brightly colored luggage that stands out, clearly labeled tags, and an itinerary in a pocket of your luggage, your luggage may be more easily found and possibly forwarded to you before the holiday is over. When you are flying during the holidays, make sure you sign up for your airline's twitter feed. Most major airlines, including Delta (@DeltaAssist), American (@AmericanAir) and JetBlue (@JetBlue) have twitter handles just to deal with customers queries or issue updates. On top of that, if your flight gets canceled or delayed, the airline will send out a tweet, and often you can get your flight rescheduled via twitter as well. Using Twitter might put you before other people who are calling or waiting in line to reschedule, and popular travel blogger The Points Guy recently talked about how he used social media to solve his travel woes. Airlines commonly oversell seats on full flights to account for passengers that don't show up or cancel their seats at the last minute. However, during the holiday season when there are many more passengers than normal, overselling a flight means that you are more likely to get bumped. However, you can either avoid getting bumped, or make the most of the situation. If you are completely inflexible in your travel dates, avoid getting bumped by confirming your seats in advance and checking in as early as possible says the Independent Traveler. If you are flexible in your dates and the gate attendant calls for volunteers to give up their seats, the benefits may be worth your while. BumpTracker notes that you could earn perks such as open round-trip tickets, meal vouchers or money to apply toward a future ticket. You can also try negotiating for an upgrade into first class, or request another perk. Gate attendants are given guidelines for negotiation, and it never hurts to ask. Plan your traveling up-to-the minute with handy apps that can tell you everything from whether to take a potty break if you're on the road, to what gate your flight is leaving from. If you're headed to grandma's and the traffic is terrible, you can either sit and wait in said traffic or plan an alternate route. Enter Scout, a GPS with voice navigation for your iPhone. Scout plans your route in three different ways, then you can choose the way that bests suits your needs. You can also monitor traffic (so you can avoid it), find a place to eat or stop along your route, or even find a nearby hotel if you decide you have to stop for the night. The app is free. Whether you need to know when to pick someone up at the airport, or are trying to figure out when to leave to catch a flight, FlightStatus gives you real-time information. It's connected to over 1,200 airports, so regardless of where you are going, the app probably has you covered. What's especially nice about this app, though, is that it will send you a push notification as information on the flight(s) you are tracking is updated, so you don't have to keep checking. The app is $4.99 and is available for multiple platforms. GasBuddy will help you find the cheapest prices for gas while you're on the road. It uses your location and will plot out a map for you of the cheapest and closest gas. It's a must-have for long holiday road trips. The app is free. Whether you're thinking about an exotic destination on a far flung beach just to get away from it all, or something that celebrates the season in style, choosing your destination during the holidays takes a bit of finesse. How far are you willing to travel? Decide how many hours you can comfortably travel with everyone and scope out destinations by distance. Keep in mind though, what is normally a two or three-hour trip might be delayed substantially while you're traveling during a holiday season. Weather and unusually large crowds tend to make things move slower at airports and on the highway during the holidays. Think about whether things will be closed during your arrival dates or during your stay. For example, religious places might have services, or stores might be closed for a few days during your stay. For this reason, it's advisable to think about the things you want to do while you're away and research what stays open. Is there a special event you want to go to? Can you make reservations before you leave to guarantee you can do it during your vacation? Is the place you want to go not only open, but easily accessible during the time you are there? For example, in the Times Square area on New Year's Eve, about 15 blocks are blocked off because of the ball drop at midnight. While stores and restaurants are open, it is pedestrian-only and very, very crowded. Do you want to be around a lot of people or as few as possible? Popular beach destinations like the Caribbean or Mexico, are busy during holiday breaks, as are cities with well-known holiday attractions, like New York City. Don't let expected crowds keep you from a desired locale; just make sure you want to be where you're going while other seasonal visitors are also out in full-force. How you answer these questions will determine where you will go and for how long. Whatever you decide, make sure that there are enjoyable activities planned for everyone who will be going. Not sure where you want to go? While of course you might pick a destination based on how warm it is, or an event you want to see, the destinations below are hits with other travelers who are also seeking to get away from it all and celebrate their holiday somewhere else. 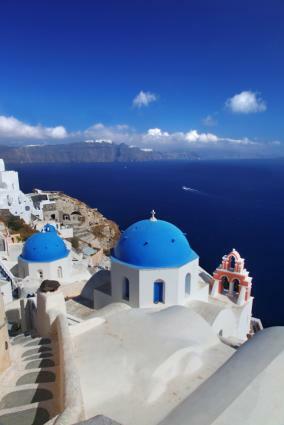 Choose one of these spots, or get inspired to find an even better destination! Sure, lots of people go to New York City for New Year's Eve - it's practically the epicenter of American New Year's Eve celebrations. However, if you don't want to join the throngs of people who are freezing whilst waiting for the ball to drop, rumor has it that La Concha Resort in Puerto Rico has the one of the best parties around. Apparently La Concha is generous with the conquitos (Puerto Rican version of eggnog), and has a great fireworks display to ring in the New Year. Easter in Greece is a sight to behold. Centuries-old traditions, from the procession of the epitaph to the Good Friday dinner, make this a particularly engaging experience during Easter. However, even for those who aren't of a Christian persuasion, there is a rocket 'war', copious amounts of specialty foods, and lots of authentic music to enjoy. Memorial Day is the typical kick off to summer, but it's also a day to remember those who gave their lives for the cause of freedom. As you may guess, Washington D.C. is an ideal place to celebrate the day with good, old-fashioned American pomp and circumstance. The National Cemetery puts out flags on all the graves and there is a wreath laying ceremony at the Tomb of the Unknown Soldier as well as a phenomenal National Memorial Day Concert. Everyone might think New York City for Thanksgiving, and of course there's the Macy's Day Parade and lots of Black Friday shopping. However, don't overlook San Diego, which boasts the Thanksgiving Dixieland Jazz Festival, well-worth the visit to the West Coast city. Plus, there's the bonus that you can hit up the beach or find a free family activity to help round off your turkey day celebration. Holiday travel can be some work but with the right planning and preparations, you should be able to save some money and have a great time. Just remember, plan early and leave extra time for whatever you decide to do, and enjoy!